A threshold is a place of potential; a delineation between one set of conditions and another. A place to gather resources. A cusp or an edge we may not have approached, or crossed over, until now. As we move through time, we may find that each moment or new season requires something different from us. Even in times of relative stability, the world is poised to offer surprises. As citizens of a changing world, we may find ourselves being called to ‘step up,’ change course, learn new skills and perspectives, or take creative action that we haven’t taken before. 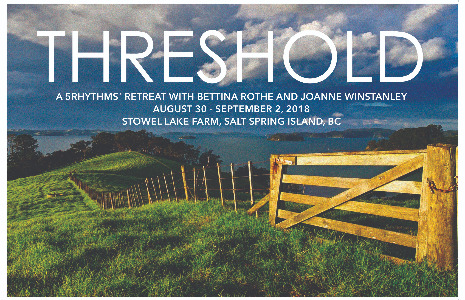 In this year’s retreat we’ll engage with the 5Rhythms® movement practice, ritual, and meditation to investigate this place of potential. We’ll explore where we may be ready to step beyond our own edges and we’ll practice moving, with purpose and presence, from awareness into action. Supported by the land, guided by the 5Rhythms maps (Waves and Heartbeat) and accompanied by a committed group of dancers, we’ll gather and embody the resources we need to step into the fall. is a retreat centre, an organic farm and a community of families living together. - 9 locally grown organic meals that are infused with love. Vegetables grown on the farm are used whenever possible. The meals are vegetarian with the exception of a salmon dinner on Friday evening. Save $5 on your registration and e-transfer! All cancellations will incur a $50 administration fee. Cancellations after August 15th will receive a 50% refund. no refunds can be issued for cancellations after August 28th.